This is a time of year where many of us feel a change in the air and start to consider goals we want to accomplish after the summer season. It seems ingrained in our psyche since childhood that this is a time to get serious and remains with us even when we are long out of school. In considering health and fitness goals, something came to my mind today after reading a fascinating book, Instant Emotional Healing-Acupressure for Emotions my fellow trainer and friend, Steve Elvins showed me recently. The concept is emotional fitness, meaning taking care of our own emotional health on a consistent basis. Most of the time, most of us are trying to juggle so many things in our lives. In our business, we see that January and September bring people strong motivation to make lifestyle changes in addition to ramping up other areas of their life. My thought here is to suggest exploring the emotional motivation behind the desire to make healthy lifestyle changes. Most of us want to feel better physically, mentally and emotionally. Approaching health and fitness from a positive standpoint of taking better care of yourself as a whole person also improves emotional fitness or well being, which makes it easier to make lifestyle changes permanent. The current general trend in fitness appears to be shorter, more intense workouts. As an experienced trainer, I must say some fitness level is required before pushing yourself at higher intensities. However, shorter workouts increase a person’s compliance, and staying consistently active in and of itself builds fitness. A workout that is fun and with an energetic group setting also helps a person stick with a program. ShockWave was a superbly fun and challenging fitness class with an inclusive team atmosphere. The workout was an intense 24 minute circuit of 4 exercises, with rowing intervals being one of them. It was a unique experience, easy to follow, fun to do and a great workout! So far, it appears to be available at Equinox clubs in the US for now. Try it if you get a chance, you’ll be sure to enjoy it. Ps. We have the rowers at our training studio now, so watch for our small group training class with rowers! I attended a fitness conference last weekend and learned a vast array of great information for living a fit and healthy lifestyle. The most applicable take home piece for myself and clients is-Make one change at a time. When you are newly motivated to try something different, it is tempting to make many changes at once. However, making one change has a success rate of 85% and making two changes at once has a success rate of 15%. So clearly, if long term lifestyle change is the goal, then making one change at a time is most effective. We just have to fight our urges to overhaul everything at once. Challenging, but more effective in the long run. This recipe is inspired by a great dip that Chef Melissa Saunders has made a few times. Her version changed my mind about black bean dip, as I’m not the biggest fan of black bean dip. Her dip was so tasty that I became open to making black bean dip myself sometime. I used this dip for raw veggies and even more fun, a black bean and cheese quesadilla made with corn tortillas. In a food processor, pulse black beans, garlic, olive oil, lime juice, and jalapeno on high until smooth. Season with salt and pepper to taste, add cilantro and pulse again until well blended. Enjoy with fresh veggies, chips or in a quesadilla. I developed a love for callaloo while I was in Jamaica. 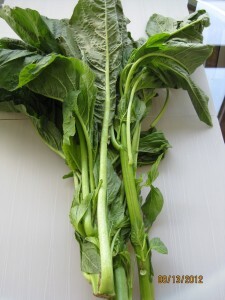 It has to be one of the tastiest green veggies around and it is so easy to eat a good volume of it. I have found it here in Toronto at Caribbean Corner in Kensington Market, so look for it at a Caribbean grocer near you. There is some technique to handling this plant once you have it in your hands. Separate the leaves and the stems throughout. Use a paring knife to remove the fibrous outer coating from the stems. In a large pan, heat olive oil and garlic over medium heat. 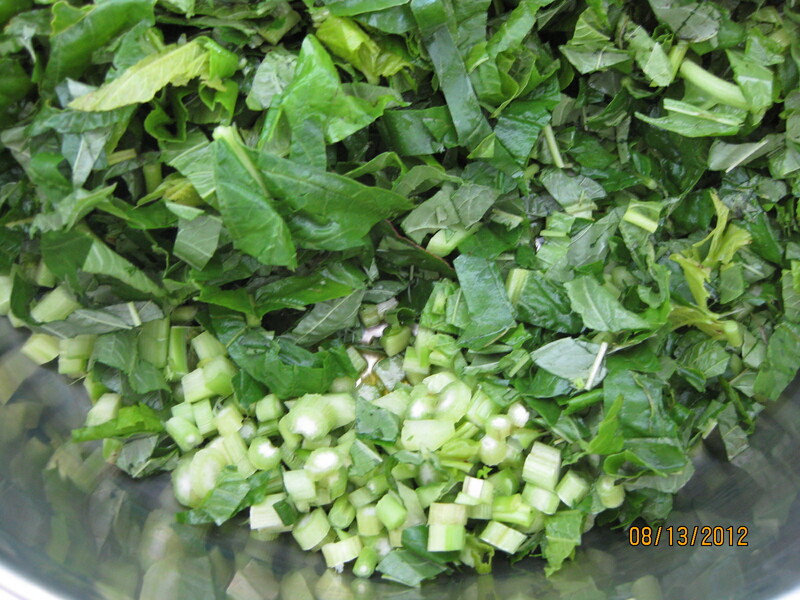 Add cut callaloo, saute for 2-3 minutes or until leaves start to wilt. Cover pan and continue to cook for 3-4 minutes. Season with salt and pepper or any other seasoning to your taste. Enjoy! Here is another fat loss tip that is also a general health recommendation. Our body is composed of nearly 75% water. That water in our body needs to be constantly refreshed, as water is needed for every physiological process that occurs every minute within our body. Here is a calculation that gives you a daily water intake goal that helps you reach optimal hydration and therefore optimal physiological function within your body. Being closer to optimal hydration and physiological function supports fat loss. This number may sound like a lot to some people. That is alright. Being healthy is a daily process, so this is a lifelong health habit we can all work on daily. Even if you had only one glass of water yesterday, making an effort to an extra glass today and slowly building up to your water intake goal, day by day, week by week will make a difference to your health. All of us need to eat more greens, including me. For those who are looking to lose some fat, eating more greens is an excellent way to increase your intake of nutrients, which helps with fat loss. In fact, eating greens is a healthy habit to try to incorporate into daily life to maintain optimal health. Eating more greens can help a person to shed fat, because it can help a person to eat fewer calories by inadvertently displacing higher calorie foods. You feel more full eating when you eat more greens, so you eat less starchy foods without even noticing. Greens in general provide a range of phytochemicals and antioxidants, which the body uses in the process to build and repair tissue. These are processes that are important in maintaining optimal health and supporting fat loss. Try adding 1/2-1 cup, cooked, of the veggies listed below on a daily basis for health improvement and fat loss. As a fitness trainer and nutritionist, I have had many discussions with many different people on healthy eating and what I eat myself. When I am asked what do you eat? My answer is food, real food. By real food, I mean natural, whole, unprocessed foods that are easily identifiable from the source to my plate. The recipes I post on my site here are composed of natural whole foods that are enjoyable to eat and highly nutritious. The term ‘natural’ food in itself is debatable in our world of mass food production. There is a lot of information out there that warns us of what is bad for us. I answer a lot of questions and enter a lot of debates on ‘bad’ food as well. This article is absolutely hilarious, because it captures the way thinking of many people when they get into ‘healthy’ eating. If we took every piece of information on what is good and/or bad for us and followed it to the letter, there is pretty much nothing to eat without distress. Feeling constant mental anguish over food choices is actually counterproductive to being healthy. Healthy eating is part of a healthy lifestyle, which is something that has to be taken care of daily. It’s a commitment to taking care of yourself. In my opinion, food is to be enjoyed first and foremost. There are no bad foods, just foods that ought to be eaten more often, less often or infrequently. The more you choose and enjoy nutritious foods, the more you will develop a taste for healthy food and processed food simply loses its appeal. The more conscious and aware you become of how you feel when you eat certain foods, it becomes even easier to choose healthy ones. Enjoy your veggies and fruits and even better when you grow it yourself or someone close by grows it. This recipe came to my attention from a client in April and I finally tried it this past weekend. The recipe originates from the chef at Dish cooking studio. I was reluctant to try it at first, because I do not enjoy the taste of quinoa flakes. However, this is a great gluten free recipe if you stick with the quinoa flakes or use gluten free oats (my preference). These waffles were great the next day, toasted and topped with Nutella and fruit. I would not recommend them hot off the waffle iron, as they were a bit too soft. In a medium bowl, combine all dry ingredients except for the brown sugar and mix well. In another bowl, beat together eggs, mashed banana, coconut oil, milk and brown sugar or honey. Add wet ingredients to dry and lightly mix together. Be sure not to overmix to ensure a tender waffle. Have waffle iron heated to desired setting. Pour batter into prepared hot iron, cook to desired doneness and remove from iron. Cool and store in an airtight container. Serve toasted with Nutella and fruit.